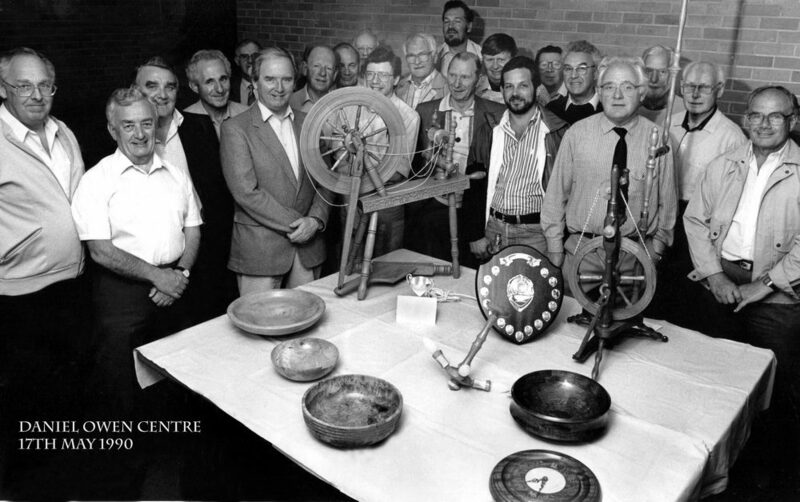 On the 17th August 1987, professional woodturner Keith Lawrence organised a Woodturning Exhibition at Tri Thy Craft Centre near Mold. He had a workshop in the complex and a small group of enthusiasts who he was teaching to turn. Those attending admired the work that had been produced and were asked to leave names and addresses if we were interested in forming a Club. An invitation to a meeting at Tri Thy on the 8th October 1987 arrived. The meeting was Chaired by Bob Swaine (of Pewter Tankard fame) and was attended by 24 people. 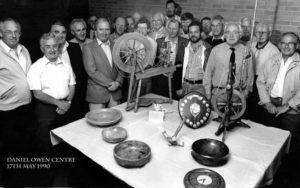 A Steering Group was formed to establish the format for a Club or Association to bring together local woodturners, both professional and amateur. The Group was chaired by Horace Sinclair (of Shield fame) and comprised Robert Luke, Ken Owen, Les Turner, Martin Pantony (Scribe) and Keith Lawrence. It met on 15th October to draft a Constitution and again on the 29th to draft an 87/88 programme. All of those who had signed up on the 17th August were written to again and invited to an Inaugural Meeting on the 19th November 1987. 37 people attended at Tri Thy. A name (Cheshire and North Wales Woodturner’s Association) plus a Constitution and Programme for 87/88 were agreed at the meeting and a Committee was elected: Horace Sinclair (Chairman), Martin Stanway (Treasurer), Martin Pantony (Secretary), Robert Luke, Alec Garfield, Ken Owen, Bob Swaine and Bob Jones (Committee Members). We agreed to meet at the Daniel Owen Centre in Mold and, if memory serves correctly, did so for our first meeting in December 1987. Unfortunately, no copy of our first programme has come to light but, from Newsletters produced in April and November 1988, the range of activities was a Timber Market with swaps and giveaways, days out to John Body in Yorkshire and the Wembley Exhibition, a talk by Alan Holtham, Members evenings for a chat and coffee, a Social Evening, a Talk on Tools, Videos of Turning Techniques and a Competition Night in September 1988………… the rest, as they say is history! Footnote: Rob Jones has kindly supplied us with this very early club photo, showing one of the prize givings with some of the founder members.